Bridgeton Boatworks is a full-service boatyard that takes care with every boat we service. From the simple bottom job and cosmetic repair to the complete refit, we have the tools and expertise to do the job correctly and in a timely manner. Bridgeton Boatworks recently added a 77-ton travel lift, now the largest on the Neuse River. With two lifts, we can service the needs of almost any local and regional boater as well as those traveling up and down the coast and the ICW. We’ve also added new docks and renovated existing facilities and equipment. Click items on the list below for more detail. Now operational, our 77-ton travel lift and a new slip. It’s the largest travel lift on the Neuse River. We can accommodate almost any size boat including those going up and down the coast as well as those on the ICW. This travel lift has been a workhorse with us since we started. We built a new travel lift slip at the time to accommodate it and its now been joined by its larger 77-ton brother. Our boat ramp is well paired with this hydraulic trailer, providing the capability of hauling multi-hulls up to 18,000 pounds. We are exploring the option of obtaining an even larger hydraulic trailer. For work that doesn’t require a haul out, four recently-built boat slips can accommodate wide boats such as catamarans and trimarans. P and H T-250 mobile hydraulic crane. 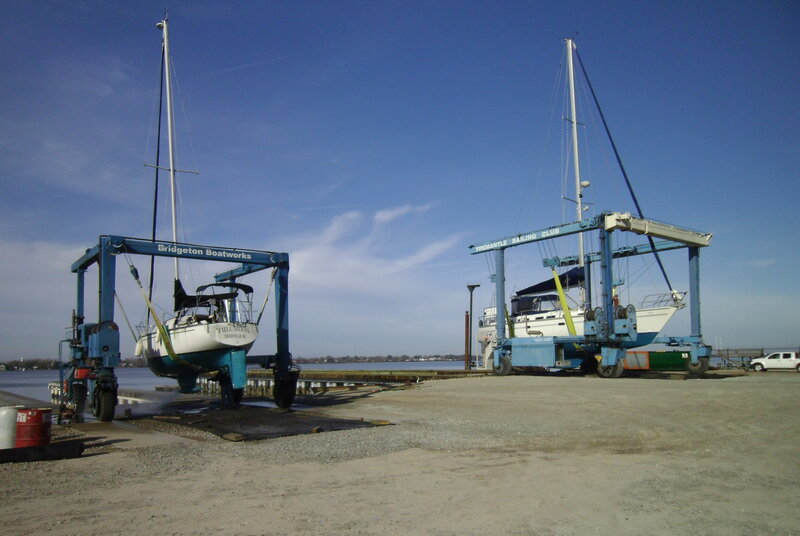 The repair facility is fully equipped to meet all of your boat maintenance needs.